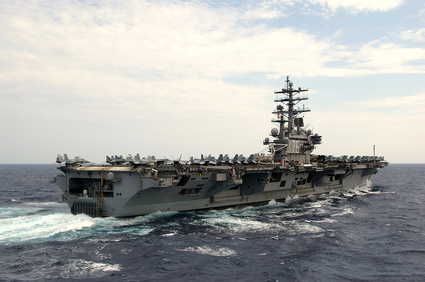 Just like the Army, Air Force and Marines, America's Navy is striving to become greener. They are doing it through experiments with new, renewable fuels, new propulsion technologies and even new ship designs. In an era of diminishing (and ever-more expensive) resources, the Navy brass has recognized that it's becoming increasingly important to find less expensive, renewable sources of energy. Since the launch of the first nuclear-powered submarine, the Nautilus, in 1954, the Navy has done an admirable job of integrating nuclear power into the fleet to enable it to extend its seaborne missions for months at a time without refueling. U.S. nuclear vessels, including all of its aircraft carriers and submarines, have enjoyed one of the best safety records of any nuclear-powered fleet in history. According to an article posted on the World Nuclear Association website, "The US Navy has accumulated over 6200 reactor-years of accident-free experience involving 526 nuclear reactor cores over the course of 240 million kilometers, without a single radiological incident, over a period of more than 50 years." That's an impressive safety record; far better than has been enjoyed by land-based nuclear power plants, but nuclear vessels do have their limitations. For one thing, they're expensive to build. For another, nuclear fuel is expensive to refine, plus, the waste from nuclear reactors is highly toxic. If there are accidents, such as those that have plagued the U.S.S.R's nuclear fleet, the resulting catastrophe can leave a radioactive reactor core and other waste littered all over the ocean floor. There's no telling what health or environmental consequences those kinds of nuclear incidents will create in coming centuries, but you can bet that they won't be good. So, on balance, it's probably a good thing that America's nuclear navy is only a small part of our fleet, and that currently; other power plant and fuel options are being explored. One innovative example of the Navy thinking outside of the diesel power/nuclear box is the amphibious assault ship, USS Makin Island. Unlike the other ships in the Wasp class of vessels, the Makin Island does not rely on inefficient oil-powered steam boilers for power while underway. Instead, the Makin Island packs a pair of 35,000-horsepower gas turbines that supply acceleration on demand up to 25 knots. However, in addition to the gas turbines, the Makin Island's engine room includes a bank of 4,000-kilowatt diesel-electric generators and twin 5,000-horsepower electric motors. The electric motors aren't as speedy as the gas turbine engines, but they enable the Makin Island to use only a third as much fuel as one of its conventionally-powered sister ships. This means that, when at sea, the Makin Island can share some of its 2,000,000-gallon fuel supply with sister ships that are running low, thereby enabling all of them to stay in the fight longer without refueling. In fact, the Makin Island saved U.S. taxpayers $2 million dollars worth of fuel on its very first cruise. However its green features don't end there. The Makin Island also houses a highly advanced reverse-osmosis desalination plant that uses no chemicals and produces no waste salt. That means that this ship not only produces enough water for its crew of 1,000 sailors and 800 marines, it can also sail to regions stricken by disasters, supplying ample fresh water and reliable power to civilian populations. The Makin Island is only one ship, and it's not totally green since it does use some fossil fuels to power its generators, but it's a first step in changing the way our Navy sails, fights, and uses fuel. The good news is that other ships of this type are in the planning stages, including the next wave of amphibious assault ships, the American class. As these more advanced, "greener" warships come into the inventory, the old gas hogs will be mothballed. Another way that the U.S. Navy can promote the use of green technologies in the civilian world is by switching over to biofuels. Although the Rand Corporation doubts that our military can make the switch to biofuels in any meaningful way, the Navy's first deputy assistant secretary for energy Tom Hicks is confident that, as in the past, the military's need for new technologies such as biofuels will promote innovation and make biofuels not only more widely available, but also more affordable, so they eventually become less expensive than fossil fuels. Just remember, our military isn't getting greener for ideological reasons; they're simply among the first large organizations to realize just how much economic sense it makes to go green as the 21st Century motors along.